Sausage made from lean pork loin boneless, tanned and aged for three months. Unmistakable scent, it is an excellent addition carpaccio with arugula and parmesan. The pork loin is a sausage made from lean pork loin boneless subjected to tanning and aging for a period of three months. 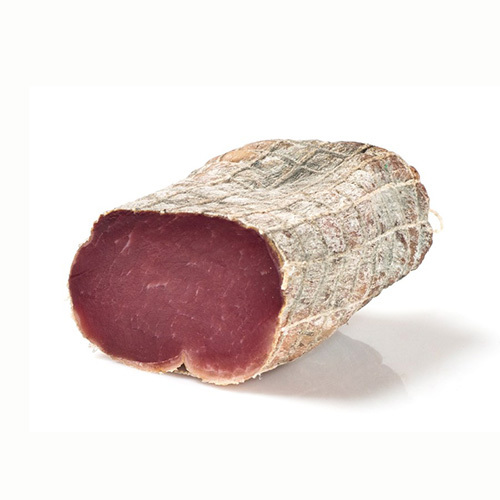 The pure pork meat used in the production of this fine salami comes from pigs reared in open territory and fed mainly with dried beans. It ‘an old sausage that must be treated with care to be savored in all its taste. The harmony of the flesh finely worked together with simple flavors gives the loin seasoned a unique scent and taste fresh but at the same time along the palate. And ‘advisable to keep the loin in a cool (refrigerator) that increases the firmness of the flesh and facilitates the cutting of the slices. Once at room temperature, can be tasted in quite naturally with the bread or added to recipes typical spring, one in all the loin carpaccio: accompanying a rocket, parmesan and a drizzle of extra virgin DOP, you will have a fresh dish that It will delight even the most refined palates.